Productivity is the key to success. When you run your own business you never have enough time. It’s a complaint I hear all the time “There just aren’t enough hours in the day”. You know that time = money and so you become even more conscious of every minute that passes – was that a dollar earned or spent? As everyone knows, time is easy to waste. There are a million cat videos on youtube just begging you to watch them and before you know it that 10 minute break has stretched over an hour and you’ve achieved nothing. Ahhh good old email. It doesn’t matter what you are in the middle of doing, you see a little message pop up and you can’t help but have a look. I mean it will only take 2 minutes, maybe 5 probably 10 tops. See what happened? As Riffraff would say “You’re in to the time slip!”. Instead of dropping everything every time you see that little envelope pop up try and set yourself some boundaries. Set aside a time in the morning and a time in the afternoon to check your email. A client of mine checks her email once a day She knows if anything urgent comes up I will phone her, otherwise there is nothing that can’t wait until 11am. This has boosted her productivity and allowed her to claw back hours from her week. I know you have a lot to do and doing 4 things at once seems like the best way to get everything done in the shortest amount of time. WRONG! You see people out there talking on the phone and writing an amazing blog whilst eating lunch and spending time with their kids, and you want to do it too. Professor Clifford Nass’s pioneering work on multi tasking showed that multi-taskers were TERRIBLE AT EVERY ASPECT of being able to filter information, switch between tasks quickly and keep a high working memory. And the more you do it, the worse you become at it! Single tasking is the way forward! Make a list of all the things you need to do and then line ‘em up and knock em down! If you have a lot to achieve in a small amount of time, then set an alarm so that you only have a certain amount of time to dedicate ( and I mean dedicate, no distractions) to this task. When your time is up move on to the next. 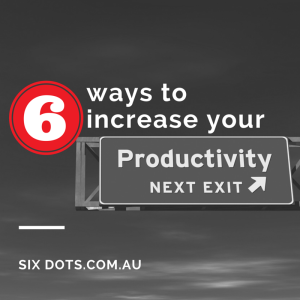 Watch your productivity skyrocket! It can be hard to focus when you are surrounded by chaos. If you are constantly wading through extraneous bits of paper on your desk or in your inbox then you are wasting time! Get a system that works for you. It can be as simple as breaking down your inbox into pertinent folders so you know where to start looking for things or using the colour coding in your mail client’s options to highlight what is urgent and what can wait. Don’t just organise your desk, organise the hours you spend at your desk! I use a great tool free online tool MyHours.com which allows me to log my time, so I have a clear idea of how long I spend on client jobs and also how long my procrastinating between jobs lasts. When you have a clear idea of how you spend your time, you can start to organise it. Set reasonable times for your work (and your play) and stick to them. At the end of every day I sit myself down with a cuppa and have a review. I look at what I achieved today and then I write down a list of all the things I have to achieve tomorrow. Writing things down solidifies your goals and breaking tasks down into actionable points makes them more achievable. You may also want to categorise them into things that need to be done before lunch and things that can be done in the afternoon. When you start your day you have a clear list of things you need to achieve and although you will then no doubt be steered off course by distractions you have an anchor point that you can keep coming back to that will put you back on track to getting things done! And I don’t mean like MC Hammer. Setting goals is when we try and make our dreams a reality. We decide what we want to achieve and yet we don’t always look at the HOW we are going to get there. Breaking it down is looking at the HOW. To make the best use of your time, you need to know exactly what you are going to do. So if *Get a Website was on your list of things to do. Break it down into manageable chunks, plan your site, write your content, pick your graphics . . When we break big tasks down into littler ones they are more manageable. As Confucius said “A journey of 1000 miles starts with a single step”. Plus there is nothing more satisfying than ticking something off your to do list. There are probably a million things that your smart phone does that you haven’t quite worked out. So instead of playing Angry Birds on there, see what you could have on there that would make your day easier. I love Evernote as it doesn’t matter where I am I can jot down ideas or take pictures of resources that I may need later. I schedule time in my calendar not just for meetings with clients but for important tasks that I need to fulfil so I am mindful of my time. ← Caroline Creswell – A breakfast to remember! Caroline Creswell – A breakfast to remember!